Musicians: Egyszólam: Zoltán Juhász - duct flute, long duct flute, flute, bagpipe Kálmán Sáringer - duct flute, long duct flute Éva Fábián - gardon, voice András Berecz - voice Kalamajka: Béla Halmos - violin Tamás Petrovits - cimbalom Péter Dövényi - viola András Nagymarosy - bass, tamburica, ádurica Éva Fábián - voice Guests: Katalin Juhász - voice Gergely Agócs - tárogató, shawn, clarinet, voice Réka Juhász - voice Dénes Juhász - voice Lilla Juhász - voice Anna Sáringer - voice Gergely Dövényi - voice Katica Szabó - voice Vocal and instrumental folk music from Hungary 1848-49. Members from both of these ensembles have been playing Hungarian folk music since the revival of the Tanchaz (dancehouse) in the 1970s. Many of the members of each ensemble have been at the forefront of folk music research and collection for many years. 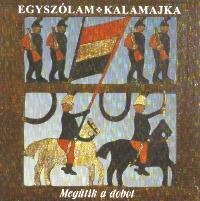 On this release they present their interpretations of songs from an historical and defining point in the history of Hungarian people, the revolution for independence in 1848. Bela Halmos from Kalamajka has worked with Ferenc Sebo, Muzsikas and on many solo projects and was a leading light of the 70s tanchaz movement. He was also featured with Marta Sebestyen on the Channel 4 television documentary on Hungarian folk music 'Treasure Beyond the Forest'. Members of the ensemble Egyszolam have been featured on previous releases and concerts by Vujicsics and Muzsikas. This new release features both ensembles playing traditional folk music instruments such as the bagpipe, flute, violin, cimbalom, clarinet etc.